In a medium saucepan on medium heat, mix quinoa, milk, vanilla and cinnamon and bring to almost a boil, stirring often. Add coconut oil and stir. Turn down heat to medium-low and cook for 15-18 minutes, stirring while cooking. Stirring will mix in the cinnamon and avoid sticking to the pan. 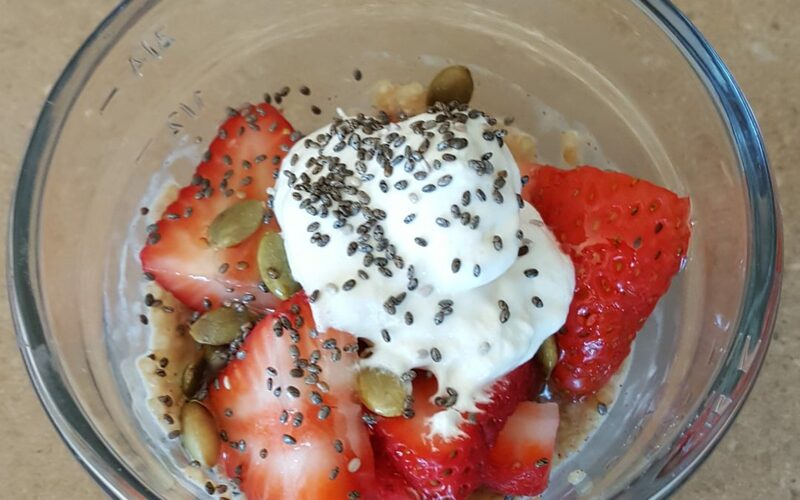 Pour ½ cup into individual portion cups, if eating immediately then top with strawberries, honey, pumpkin seeds, yogurt, and chia seeds. Serve immediately. If saving for later, then cover with lid and re-heat in the microwave the next day. Add toppings before serving.